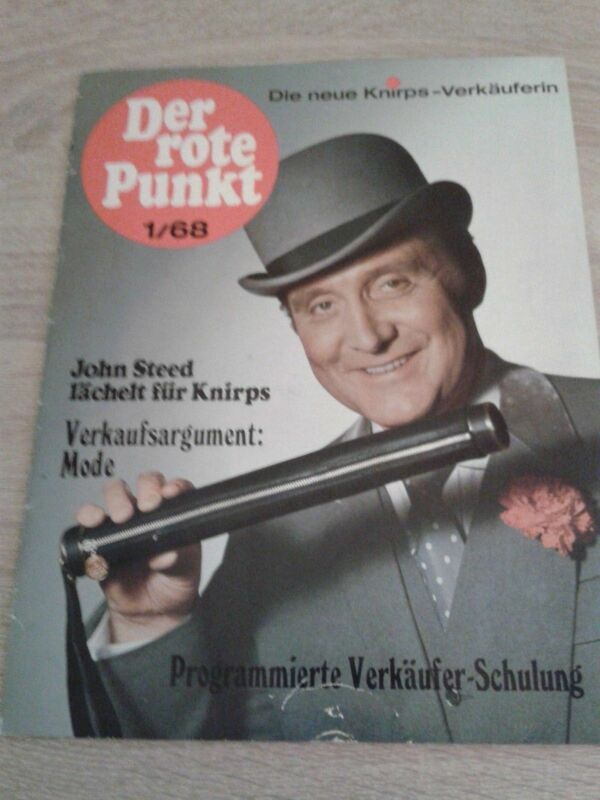 Advertising campain for the German pocket umbrella „Knirps“ with Patrick Macnee as John Steed from the British TV series „The Avengers“, that was „Mit Schirm, Charme und Melone“ in Germany. The brochure (Der rote Punkt, a red dod was the distinctive mark of a Knirps umbrella) was an information for shop owners on how to present the „Knirps“. They were given information about all available advertising material for window displays and promotional gifts for their customers, and informed about the TV advert which was produced in spring 1968, and telecasted on the major German TV channels the second half of March, around Eastern 1968. The director of the German TV spot was no one else than James Hill..."
you can find a secelction on The World of Patrick Macnee inofficial website and videos the Belgian PURRR website. Diana Rigg did adverts for Lux soap and Sanderson furnitures, German textil manufacturer Povel/Norhorn, for Swalp and Terylene textile. more information on the website of Denis Kirsanov with a page about Diana Rigg's adverts or on Avengerness, where you best search the archive section of the website.